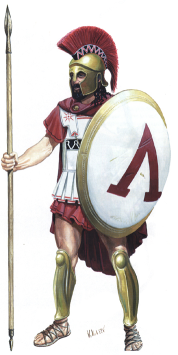 This greek Hoplite is woefully ignorant about the correct use of the pointy stick: he is obviously not wearing proper musical regalia! Pointy Sticks are primitive stone age musical instruments that have been, unfortunately, used as weapons of torture and murder. Created by an unknown Neanderthal visionary, the pointy stick was discovered in a cave in France after a strange man (who had a habit of going into deep, moist things) found drawings of the sticks on the cave walls. The pointy stick, once a beautiful musical tool used for making awe inspiring works of stick banging percussion, have sadly been used throughout history as horrific weapons of mass destruction. One can only hope that, eventually, people will stop using pointy sticks to gouge other people's eyes out and start using them the way the cavemen originally used them: hitting things to make funny noises. 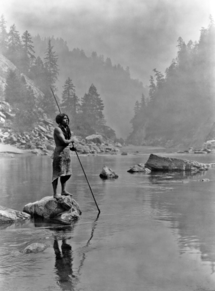 This pointy stick artist is using his stick to make a swishing sound on the water. Genius! 12,000 years ago, when man was still pure in his ways and lived in peace and harmony, an avant-garde early human, who we will name Artistic Visionary, created the first pointy stick in a cave near Bouches-du-Rhône. We know of his sad story because of his diary, which was strangely written in English, when language wasn't invented yet. Artistic Visionary toiled in his cave night and day, perfecting this exceptionally pointy musical instrument, never stopping to rest or even use the non-existent restrooms of the stone age. After perfecting his instrument, he made several more handcrafted pointy sticks and showed his wonderful new invention to his hairy brutish comrades. At first, his cave dwelling friends were confused by Artistic Visionary's verbal descriptions of "banging" the pointy sticks "a lot" to make "funny noises". After he demonstrated how to use the pointy sticks by bashing it on the ground, his cavemen comrades started violently trashing the ground with his inventions, creating beautiful music unparalleled by anything except the great musicians of the baroque age, such as Mozart and Beethoven. The pointy stick would have lived on in the annals of history as an instrument of harmony, if not for a horrible man, who we will name Disgusting Bourgeoisie Simpleton. While Artistic Visionary and his brutish comrades were creating beautiful music with their pointy sticks, Disgusting Bourgeoisie Simpleton refused to join the group and left them to hunt for more innocent animals. While killing an innocent saber toothed tiger, he found it hard to penetrate the tiger's hide with his one good arm (the other arm had been ripped of when the saber tooth tried to defend himself from the marauding man) so he used the pointy stick to stab the animal dead so he could greedily feast on the carcass. After dragging the dead animal corpse for miles to his Neanderthal camp, Disgusting Bourgeoisie Simpleton showed his group how to stab innocent creatures and kill them. Unfortunately, the normally intelligent Neanderthals were stupidly swayed by the horrible man's ideas, and the cavemen used the musical instrument as a weapon to murder. Eventually more and more cavemen used the pointy stick as a tool for hunting, until no one knew of the pointy stick's original purpose. Saddened by the misuse of his invention, like all great artists, Artistic Visionary killed himself with his own pointy stick. Before he committed suicide, Artistic Visionary kept his journal safe from harm so that future generations might relearn the proper use of the pointy stick. Fortunately, the journal is kept safe in a museum away from the general public, who might steal the yellowed 11,000 year old torn sheet of dirty paper with barely decipherable brown smudges on it for some reason. All those sticks, but the only music is the sound of trampling of feet and the spilling of organs. What a needless waste of pointy sticks. While the Phoenicians were still trying to get their primitive twig rafts to float, and Remus and Romulus were actually quite friendly with each other, the Greek empire was in full swing. A group of strong city-states, the cities would quarrel with each other and other countries, using the pointed stick as weapons to maim other people. The Hoplites (pictured on the top right of the page) were infamous for their misuuse of the pointed stick. 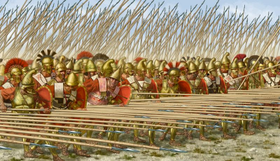 While battling others, the uncultured, barbaric Greeks used Phalanxes, which were formations of men with pointy sticks used to stab other people. The primitive, violent Greeks horrific misuse of the pointy stick would be their end, when (in a completely unrelated event) they were conquered by the Romans. The Greeks disgusting stick stabbing culture would eventually infect the Roman Empire, and cause their downfall too. The Roman Empire, a violent empire that in no way whatsoever contributed anything valuable to the human race, were out of weapons that they could use to vivisect innocent nomads, so they adapted the Greek practice of using pointy sticks to kill humans, and continued their murderous rampage across Europe. The romans built many more pointed stick weapons, but instead of banging them on the ground to make funny noises, the barbaric Romans used the weapons to conquer and spread their tyranny. Fortunately, their reign of terror came to an end when their over expansion caused massive inflation. The Byzantine empire, which lasted a thousand years longer, didn't fare much better when their last city was conquered by the Ottoman Empire, another horrific "culture" who didn't use the pointy sticks as musical instruments. It seemed that the pointy stick's true purpose was forever lost to time, but a breakthrough discovery centuries after the Romans would bring a glimmer of hope to the once graceful, pointy stick. Like all musical geniuses, Enlightened Artistic Visionary died on a toilet. It seemed to some that no one would use the pointy stick as an tool of harmony, and that the wonder of the beautiful musical instrument would forever be associated with the cruel act of stabbing. But finally, after thousands of years in an unenlightened world, the journal of Artistic Visionary was found in a cave by the aforementioned strange man; a new ray of hope shone upon the once downtrodden stick. Another persecuted Artistic Visionary, Billy-Bobby Samson, who we will henceforth call Enlightened Artistic Visionary, would be the pointy stick messiah that would bring an end to the dark ages of man. Unfortunately, this visionary would meet the same fate as his spiritual ancestor, but his spirit lives on in the men and women who continue to keep his spirit living on, and stuff. After he broke his skull on the sidewalk, Enlightened Artistic Visionary began to realize his own mortality, and started to question the all encompassing axioms implanted in our brain by society. Not finding answers to his deep, complex questions, Enlightened Artistic Visionary, using his vast wealth acquired by him in a small town in rural Kentucky, traveled the world to seek the truth. He meditated with the enlightened monks of Tibet, studied the scriptures of all faiths, traveled the deserts of Africa, and met with with scholars and professors in Europe, but his deep questions about deep issues still remained unanswered. He was bout to give up when he found out about the journal of his spiritual ancestor. He traveled to Bouches-du-Rhône, where the journal was located, and studied it for hours on end. Finally, he found the answer to his answers: pointy sticks are musical instruments. He returned home to bash pointy sticks on the grounds, until the police stopped his beautiful music, and sent him to an insane asylum. He escaped, only to kill himself on the most graceful of thrones, the toilet. Though Enlightened Artistic Visionary died, the truth of the pointy stick hasn't. Already, schools all across the world are being formed to teach young pupils of the proper use of the pointed stick, with many mouth drooling and stick thrashing lessons being taught. Thousands of years in the future, when mankind is enlightened, and extraterrestrial beings come to earth to see if we are worthy to be ascended to a higher plane of existence, they will see us hitting things with pointy sticks. And they will see we are worthy. ↑ The Neanderthals were known for their peaceful and non-violent behavior, and their care for cute ice age animals. ↑ Killing innocent animals for food? Why didn't he plant a vegetable garden with his steel hoe and organic fertilizer? ↑ In a true gesture of poetic artistry, he successfully used irony by stabbing himself, which did not make a funny sound. ↑ It seemed to me, but no one I know shares my opinion. ↑ When she wasn't beating him with a rolling pin in a traumatizing yet comical way. ↑ That I will not specify, but they are very very deep. ↑ Or as the scholars of the old world call them, the loo.